The movie that should have won the first ever Best Picture Oscar. It’s about time for this column to look back for a moment and delve into our library of DVD treasures. The reason is obvious: Most people passionate about film now spend as much time with that library as with new pictures. I’m talking about 1928, a very good year. Who is sure of the gap between those two categories, then or now? The production Oscar went to William Wellman’s Wings, a spectacular account of the air struggle from the Great War; it had dog-fights, heroism, exciting air footage (Wellman had served in the Lafayette Escadrille). It had Clara Bow and Gary Cooper, vivid in a small role. Everyone guessed it was going to beat the other four nominees. In the “artistic” area, there was a closer contest, between King Vidor’s The Crowd and Friedrich Murnau’s Sunrise. They are both daring, beautiful, and inspired by the thought of extending film’s reach when the medium was still (for a moment) silent. Sunrise beat The Crowd, but you could do worse than run the two films and argue it out yourself. 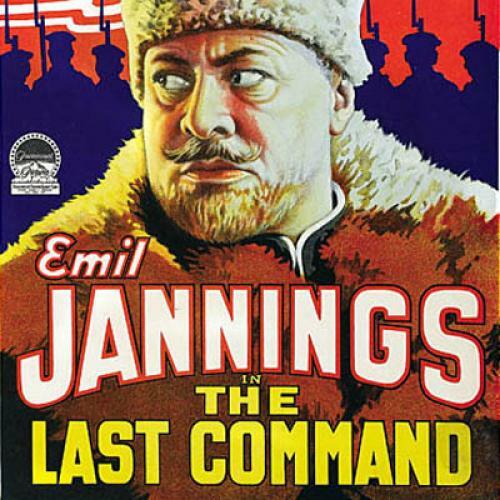 The best film on show that night (in my estimate) was another picture altogether, one that lost to Wings: Josef von Sternberg’s The Last Command(released last year on a Criterion set of DVDs, with Underworld and The Docks of New York). But how could the Blossom Room crowd in May 1929 know The Last Command would look the most modern of all the nominees, over 80 years later? The film opens in Hollywood, in 1928. A Russian émigré director, Leo (played by the suave William Powell), is preparing a picture set during the Russian revolution. Looking through photographs of extras he finds a face he remembers. He has that face sent for—he is or was Sergius Alexander, grand commander of the army of the Tsar. But now, he is a pauper with a tremor living in lodgings and waiting for work. He goes in, he collects a general’s uniform. He tries to make up, but, as he looks in the mirror, he sees his past. All of a sudden, his crushed air gives way to the pride, authority, and sexuality of the General. The double-role was a vehicle for the German actor Emil Jannings (who actually won the Best Actor Oscar for the film). In 1917, Sergius encounters two “revolutionists”: Leo and his lover, Natasha (Evelyn Brent). He strikes Leo in the face with his whip and seeks to take Natasha for himself. She goes along with his desire, but, at first, it is to destroy the General. I won’t go deeper into the plot, because the film needs some secrecy if you are going to enjoy it properly. But it follows a key to Sternberg’s work as a whole—that affairs of the heart are more profound than revolutionary politics. You may not agree with that, but it was part of Hollywood’s conservatism and Sternberg’s fatalism. The storylines in The Crowd and Sunrise are full of conventional sentiment, and, whatever the qualities of the two films, an audience today must make a concession to those values and their industrial push from Hollywood. But The Last Command carries its pathos lightly as part of an ironic analysis of acting and identity. The story is moving, but the film is as cool and detached as Sternberg would always be. And Sternberg is a true master. The Last Command is credited to Lajos Biro, a contract writer at Paramount, and the titles are by Herman Mankiewicz, who would help write Citizen Kane. But, in his autobiography, Fun in a Chinese Laundry, Sternberg says he wrote the script from an idea by Ernst Lubitsch, the German who had come to America in 1923 and whose work ranged from Trouble in Paradise to The Shop Around the Corner. That rings true. This is a grown-up picture, and you can feel Sternberg’s delight at depicting Hollywood itself. In history, he was driven mad by Jannings. You would not guess this from the picture: Jannings, who could overdo breathing sometimes, is impressive and touching. But, a year later, Sternberg went to Berlin to make The Blue Angel, another vehicle for Jannings’s self-importance and his capacity for humiliation. Sternberg turned the knife. He had come to loathe the actor, and he elevated Marlene Dietrich to play the cabaret singer who seduces his pompous school teacher. The director did this with relish as he himself fell in love with Dietrich—an act that set him up for humiliation. In recommending The Last Command, I might add—at this time of nominations—that you need not trust the Academy. The Last Command lost, but so many of our best films were never nominated: Rear Window, His Girl Friday, The Shop Around the Corner, The Lady Eve, Some Like it Hot. The list is longer. Criterion has presented the three Sternberg films in excellent prints with useful commentary and background. The Last Command is #530 in their catalogue. I should admit I have sometimes worked for them. Still, when honorary Oscars are being thought of for essential contributions in film, the Academy might remember Criterion.